Below is an example of an Achievement Metrics Risk Prediction Report. 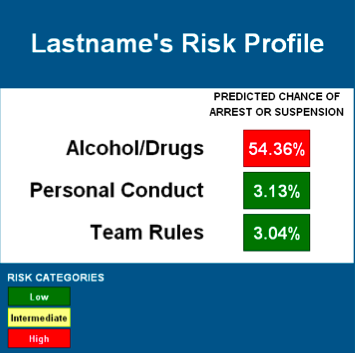 Risk Summary: [First Name] [Last Name] has a 54.36% chance of being arrested or suspended for alcohol- or drug-related offenses, placing him in the high-risk category for this type of behavior; his predicted probability of arrest or suspension for this behavior is higher than 98% of other players. Lastname’s 2.11% chance of being arrested or suspended for other personal conduct issues, and 3.04% chance of being suspended for violating team rules place him in the low-risk category for these two behavior types. Note: The predictions included in this report were generated using statistical models developed by Social Science Automation, Inc., based on 592 players’ college speech and their arrest and suspension records while in the National Football League. Social Science Automation has identified similarities in the college speech of players who have gone on to be arrested or suspended for certain behaviors while in the NFL; other similarities have been identified in the college speech of those players who have avoided arrest or suspension during their NFL careers for these same behaviors.